49-year-old Christine Westgate from New Hampshire, USA, decided to sign up for the Journalism Project offered by Projects Abroad in Mongolia for one month. Wanting to gain experience in writing for a newspaper, Christine was placed at the country’s first independent English newspaper, the UB Post. Currently, Christine is completing her second degree in comparative literature before starting a PhD in global health policies; her education and her previous experience writing for a college newspaper motivated her to volunteer at the Journalism Project where she edited and wrote articles for the newspaper. As the UB Post is published on Mondays, Wednesdays, and Fridays each week, she had to prepare articles to meet these deadlines, review them and occasionally review other people’s work. Christine was also given one assignment to attend a concert featuring a modern showcase of traditional instruments, and cover its content from a foreigner’s point of view. “There’s a fine line between writing like you would in a personal journal and writing something that is worthwhile to be put into publication. So there’s some sensitivity required,” she said. Some of Christine’s articles included “Meet the Sea Buckthorn: Mongolia’s Super-plant,” “Trash talk,” and “Naadam Car Camping: A Mongolian Epic in Three Parts.” She also wrote about organizations such as the Wheelchair Association and the American Center for Mongolian Studies, an area she saw as an opportunity to make a difference. “Whenever something gets in the news about an organization, it could change something for them, for the positive or negative. So I tend to write more positive journalism, for positive change”, she said. Besides her assigned tasks, Christine also worked on her personal research projects, including gathering current Mongolian literature, scripts and film, and beginning work for a business research health statistics database. She visited Terelj National Park and went camping with her host family, an experience that brought about an interesting turn of events: “We ended up staying at a government-run health camp because of the rain. That was really interesting because I think a lot of people don’t get a chance to do that,” she said. 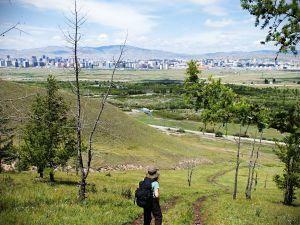 Christine’s experience in Mongolia marked the realization of a hope she once had to visit the Land of the Blue Sky. Having lived in Beijing for 2 years, experiences such as living arrangements and the hot water supply being cut off for a month are not so foreign to her. In fact, she sees her experience as being like visiting the home she left many years ago. We hope great stories like these inspire others to help Projects Abroad to make a difference, and by doing so, learn something themselves along the way.